You are buying VetriScience Feline Perio Plus Chews For Cats 60ct, model #090041B060 at ADW Diabetes, we offer a wide range of pet dietary supplements geared towards helping your pet achieve optimum health. We offer these supplements in both single and discounted bulk packs with the goal of helping you save even more. Shop with ADW Diabetes for all of your pet health supplement needs. 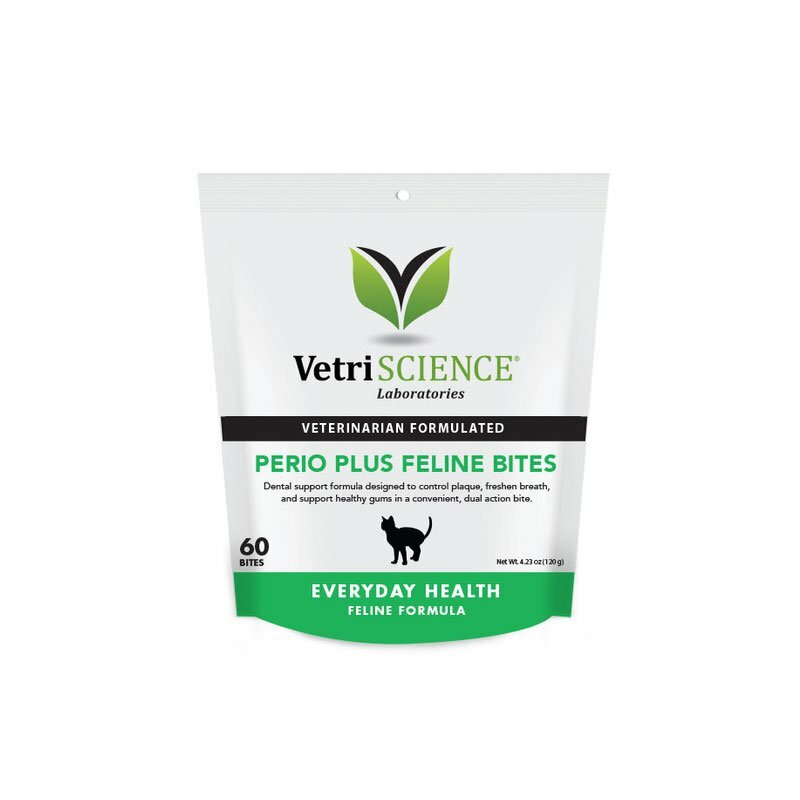 The VetriScience Feline Perio Plus Chews For Cats 60ct has been designed with two delicious layers that represent a targeted and hassle- free delivery system to support daily dental health in cats. The outer layer of Perio Plus Feline Bites promotes dental cleansing, plaque control, and fresh breath. The inner core supports overall oral health, including gum tissue integrity and fresh breath. Perio Plus Feline Bites is formulated specifically for use between routine veterinary dental cleanings. Federal law prohibits the off-label use of this product in ruminants. Ingredients: anise oil, apple pectin, brewers yeast, calcium sulfate, canola oil, chicken liver flavor, citric acid, dried aspergillus niger fermentation extract, dried aspergillus oryzae fermentation extract, dried bacillus subtilis fermentation extract, dried lactobacillus casei fermentation product, dried lactobacillus fermentum fermentation product, dried lactobacillus plantarum fermentation product, fenugreek seed extract, glucose monohydrate, glycerin, hydrolyzed vegetable protein, maltodextrin, mixed tocopherols, oat flour, propionic acid, pumice, rosemary extract, silicon dioxide, sodium alginate, sodium sulfate, sorbic acid, soy lecithin, vegetable fat, vegetable oil, water, whey, yeast fermentation solubles.